There has been no shortage of natural disaster coverage in the media lately – it’s tough to ignore. Multiple hurricanes slamming the Gulf Coast and the Caribbean during prime season gained a lot of well-deserved attention. Stories of wildfires incinerating a swath of land the size of Rhode Island and Delaware combined covered the news in late 2017, and floods remain one of the world’s most common natural disasters. High-impact areas have specific building codes that increase safety and reduce damage on new construction. The “one size fits all” approach does help build more resilient communities, but the minimal requirements might not be enough for your home to ride out the next storm. The costs of building can be steep, which might tempt you to “call it good” and settle for the minimal safety features required by these building codes; however, in recent years architects, engineers, and builders started using life-cycle analysis to assess the real cost of your home over its expected life. This helps people make the best choices for materials and construction styles to resist an area’s common natural disasters. More resistant materials will definitely put quite the dent in your bank account, but the initial construction costs are sure to be offset by reducing future repair costs. 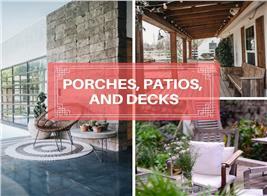 Here are some things to consider integrating into the design of your home for weather protection, giving it a fighting chance beyond building codes to withstand the whims of Mother Nature. 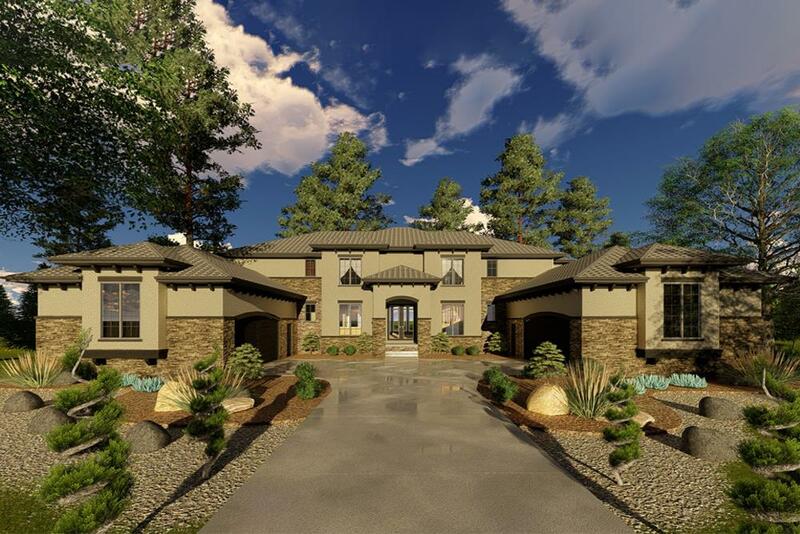 This Mediterranean/Southwest/Spanish style home plan can resist high winds, with its low-profile hip roof covered in tile. The roof tile also helps it resist damage from wildfire sparks and embers, as does the stucco and stone exterior siding (Plan #100-1331). Storm surge and heavy rainfall. Inland flooding, high winds, and rip currents. Hurricanes just scream disaster, and preparing for the effects of these hazards is an annual event for millions of Americans. Building codes already cover things like rafter ties to prevent roofs blowing off and impact-resistant glass, but additional features can be integrated into the design to make your home a hurricane-resistant building ready to brave the storm. Hurricane-strength winds can whip objects with a force like a bullet. Protecting doors and windows against high winds and flying debris is crucial during a hurricane. While building codes in many hurricane-prone areas include impact-resistant glass, it’s better to go with the “onion method” by layering more than one type of protection. Hurricane shutters are a great way to achieve this essential outer layer. They can be integrated into a design – or added to an existing structure – in an unobtrusive manner by using a simple track system. The track or other fastening hardware would be a permanent element, but the shutters themselves need only to be slipped over the windows or glass doors when a storm is approaching or when you’re away from home for an extended period of time. The extra security that these shutters provide against break-ins is an added benefit. High force winds can tear buildings apart and send roofs flying. This is an obvious danger to everything, so many construction fastening systems are code-mandated. But while systems from tie-downs and lateral anchors to hold-downs and embedded connectors are important, these options alone just won’t keep asphalt shingles in place, which is why you should consider something with more strength. Legitimate options for a secure hurricane-resistant building include clay and concrete roof tiles or, increasingly, metal roofs, which are designed to withstand the pressure caused by high winds. 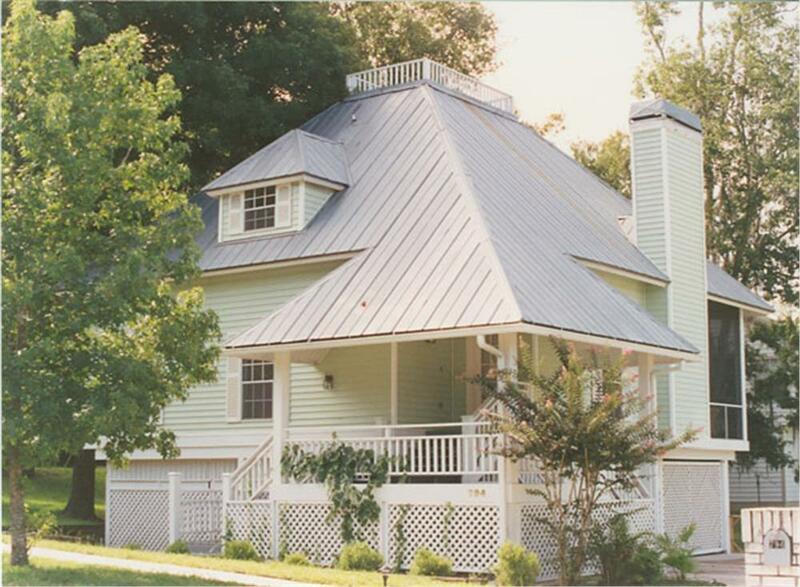 Standing seam is the most popular style of metal roof on the market, best installed with a snap lock system over a properly prepared roof deck. A properly installled and reinforced standing-seam metal roof is good protection against high wind conditions. 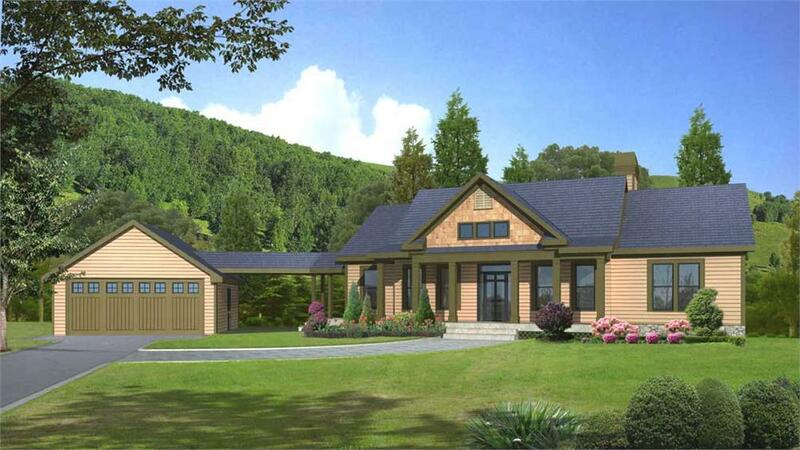 This 3-bedroom, 2-bath Southern Bungalow style home plan's steeply sloped hip roof makes it especially wind resistant (Plan #190-1001). Clay or concrete Spanish tile is also a common roofing material in Southern parts of the country and is resistant to high winds, as are stone and stucco exterior siding materials. The hip style roof of this 3-bedroom, 3-bath Southern home plan, even in low profile, is a recommended roof style to resist high winds (Plan #136-1031). Floods are among earth’s most common, and most destructive, natural disasters. Water will, in some way at some time, find its way into almost everybody’s home, even if it’s just from a roof or basement leak, but floods are especially worrisome, even if you don’t live near a flood plain or in an area that requires flood insurance. Designing a flood-resistant building requires a selection of materials that resist water damage, are easy to clean, and allow wall and floor systems to drain and dry. If you choose to build in an area with a high risk of flooding – a beachfront or coastal lot, for example – simply elevating a structure can significantly lower the risk of damage due to flooding. Post and pier foundations are most commonly associated with beach or riverfront settings. Their main purpose in those areas is to provide a footing that will support the home over loose soil or sand. This foundation also keeps the home raised above the flood level zone. In addition to having a flood-proof foundation, the gas meter and electrical services are installed approximately eight feet above the ground, reducing chances of an outage should water levels rapidly rise. These posts should be properly installed by a professional contractor with experience in flood zone areas. 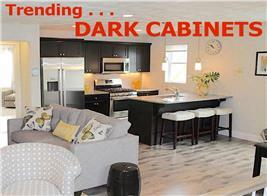 But once in place, the rest of the house can be completed by the contractor of your choice. 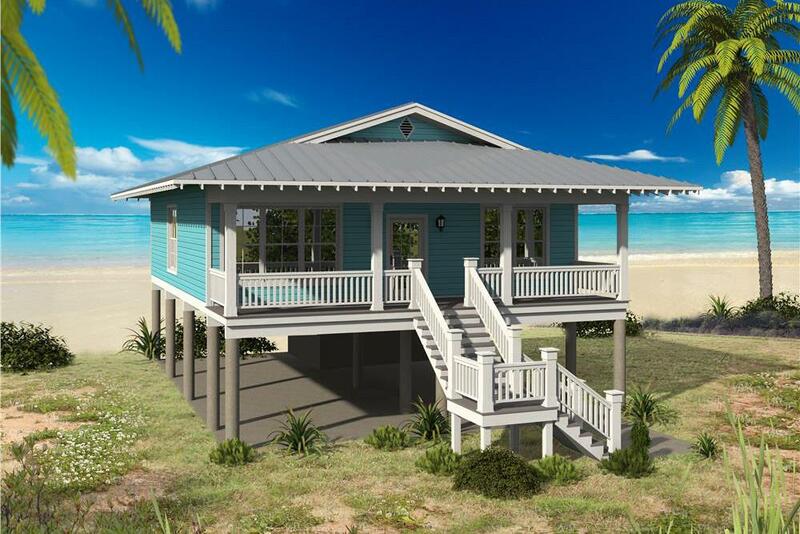 The pier foundation for this 2-bedroom, 2-bath Beachfront style home plan raises the home above ground level to prevent extensive water damage in the event of a flood due to a cosatal storm (Plan #196-1033). Choose materials that are more resistant to moisture, water, and mold. Concrete materials such as concrete tile and precast concrete are excellent options, as well as ceramic and clay tiles. These materials can be colored, polished, and sealed to match the aesthetic of your home and function practically in areas with high risk for water damage. Although some materials resist floodwater and moisture damage, they also inhibit drying. For example, when materials such as tile and plywood are used together, drying time may be reduced. Naturally decay-resistant subflooring is also a potential option, but not necessarily the most practical choice when considering post-flood damage control. Wood warps, so unless the finished flooring is removed to allow the subfloor to dry, the wood may become damaged. As for carpeting, it’s best to avoid wall-to-wall carpeting altogether and instead opt for removable area rugs. A wildfire will attack your home from the outside. Driven by strong winds, fire will reach peak temperatures in seconds and pass over your home in a matter of minutes. After last year’s devastating California fires, building codes are shifting to address a wider range of materials, and the rebuilding will result in more fire-resistant buildings. 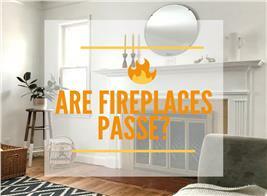 It is best to take precautionary steps before a flash fire engulfs your home. Garages are often storage hubs for some of the most flammable substances in a home, such as gasoline and paint thinners. Many rural fires actually start as vehicle fires that spread, ravaging surrounding areas. A really reasonable solution is to build these little firecrackers separately (some say at least thirty feet) from another building. This separation in buildings may prevent the greater loss of an entire home. A detached garage makes it much less likely that the main house will catch fire if a wildfire or accidental fuel or mechanical fire ignites the garage. Having the outbuildilng separated from the main structure, as with this 4-bedroom, 3-bath Traditinal Country home plan, lessens the likelihood of flame spread (Plan #163-1016). When it comes to siding, choose a skin that can withstand potential scorching. While vinyl may be adequate, there are reasons to consider dressing your home in a different armor. For one, this type of siding tends to melt and slough off at high temps. Creating a fire-resistant building using vinyl siding also requires careful attention to gaps and crevices--an ember can sneak in through the smallest of spaces. Fiber-cement, brick, stucco, stone, and sheet metal can be incorporated into the design of any style home. These are the materials that give your home a chance when up against a flash fire. Just be sure to pay close attention to the material used in smaller details of the house, such as the underside of overhangs. These are the places flames are likely to be trapped and temperatures will be the highest. 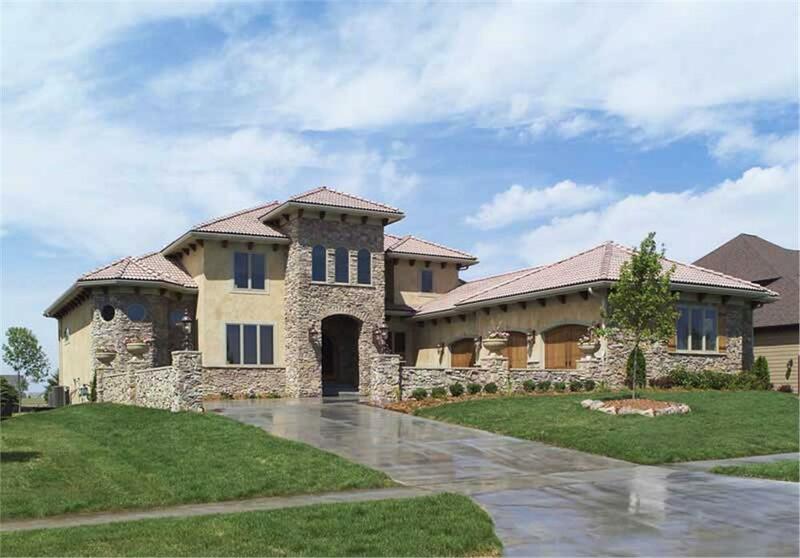 This 4-bedroom, 3.5-bath Luxury Tuscan style home plan features fire-resistant stucco and stone siding, as well as properly installed and sealed Class A fire rating Spanish tiles on the low-profile hip-style roof (Plan #101-1353). For the roof, opt for the installation of Class A, fire-rated material. Among the best are tile, slate, cement-based roofing, and metal. But even if you opt for a fire-rated material, all the cracks need to be sealed tight. Cracks and openings in Spanish-style clay or concrete tile roofs may make it easier for wind to sweep embers onto the roof underlayment or into the attic. This kind of roof requires extra vigilance. Other options involve materials that interlock tightly and securely from teh get-go – and cover a fire-resistant sheet. For obvious reasons, it’s best to avoid wood shakes; however, if you insist on them for whatever reason, have them treated with a fire-resistant seal at least every five years. Also, keep in mind the steeper the roof’s pitch the greater the fire resistance, as the embers have a better chance of rolling off before they burn through. 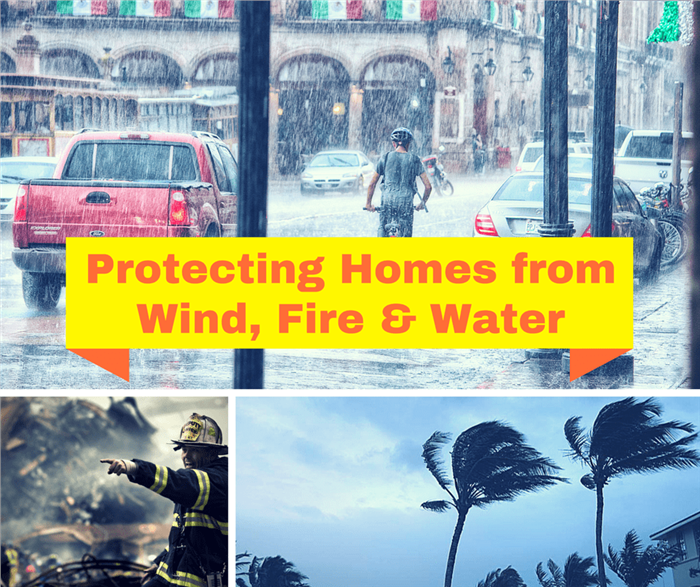 While no building can be completely natural disaster proof, choices in style and material can minimize the damage caused by wind, fire, and water. From a community standpoint, homes built with weather proofing in mind impose less of a financial burden on the government and provide greater safety for residents, as well as to the people working to provide relief efforts after a natural disaster. Footnote: The top photograph in the lead image is by Genaro Servin. All photos courtesy Pexels.